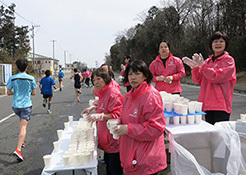 Participation as Marathon Operation Volunteers | Sanoh Industrial Co., Ltd. 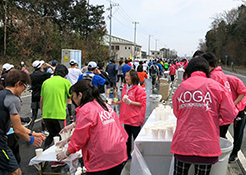 The 7th Sanspo Koga Hanamomo Marathon (10,500 participating runners) was held in Koga in Ibaraki Prefecture on March 10 (Sun). This marathon saw the participation of 33 Sanoh employees as operation volunteers. Sanoh has participated in this marathon as volunteers since 2015. We are entrusted with two water stations every year. In addition to mineral water, we prepared more than twice the amount of sports drinks we did last year so that all runners could get to drink them this year. This meant we were able to supply drinks even to the last runner. The volunteers who participated were encouraged by the words of thanks given to them by the runners. 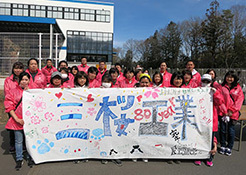 We again cheered on the runners this year by making a horizontal banner.